The symposium will be held at Sydney University’s Abercrombie Business School on the corner of Codrington St & Abercrombie St, Darlington. Close-by suburbs include: Camperdown, Eveleigh, Chippendale, Newtown, Glebe, Redfern, and Ultimo. A whole raft of other (closer, cheaper, flasher) options (backpackers, hostels, apartments) can be found via the usual accommodation websites (Tripadvisor, Booking.com, Trivago, Agoda, Wotif.com, and the like) and, of course, AirB&B (www.airbnb.com). Morning tea, lunch, and afternoon tea will be available free of charge at the Symposium, as well as nibbles and wine at the reception at the end of Day 1. There is also a café downstairs in Abercrombie Business School. Further close food & drink venues are up Codrington Road or down Abercrombie Street. King Street (Newtown), Glebe Point Road (Glebe), Crown Street (Surry Hills) are all within easy distance and offer a cornucopia of cafés, restaurants, bars, and pubs. If you are not familiar with Sydney it is recommended to get a taxi from the airport to your destination. A taxi from the airport to the CBD (city) will cost around AUD$35. 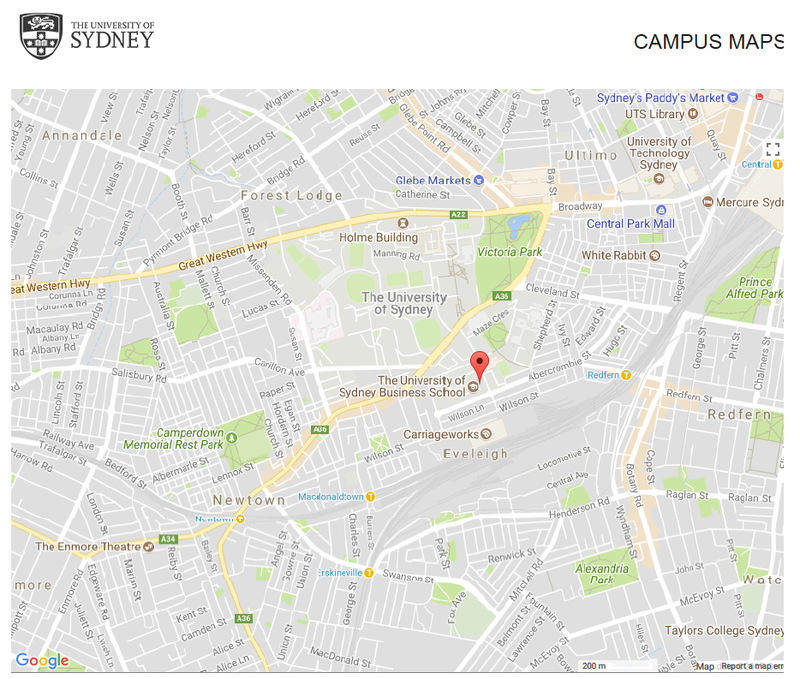 For stops on Parramatta Road (closest to the Quadrangle/Main Campus) catch routes 412, 413, 435, 436, 437, 438, 440, 461, 480 from George Street or Railway Square. These leave from Stand M at Railway Square. **For stops on City Road (closest Abercrombie Business School) catch routes M30, 422, 423, 426, 428, L23 & L28. These leave from Stand L at Railway Square. For the return trip from Sydney Uni to Railway Square (or even into the City), the easiest way to travel into the city from would be by bus. There are numerous routes that run along City Road and go into the city (M30, 422, 423, 426, 428, L23 & L28). Sydney’s public transport system consists of a rail, bus, tram and ferry network. The website www.131500.com provides up-to-date commuter information and timetables for all modes of transport. A variety of weekly passes are available for public transport. Rail passes and combined passes can be purchased from train stations, and combined travel passes (combing options of rail, bus, and ferry) can also be purchased from newsagents, who can also advise on the best option. The Opal card is a smartcard that you are required to buy only once. It enables you to have access to all transport systems that Sydney has to offer (i.e. trains, ferries, buses and light rail). You can keep the card permanently and you are required to tap-on at the start of your journey and tap-off at the end of your journey. The system will automatically calculate the fare and deduct it from your Opal card balance. If you wish to recharge your Opal card, you can do so by purchasing additional balance at an Opal retailer store, at train stations, online or by phone. c) You will not pay more than $2.50 on Sunday. This means that you are free to travel as much as you wish and pay no more than $2.50 from 4:00am Sunday until 3:59am on Monday morning. Why is it important to tap-on and tap-off your Opal Card? Another popular form of transport is taxis; they are generally a fast and convenient way of getting around Sydney but not particularly cheap. You can simply hail a taxi down on the street (lit sign = available) or contact the company directly and order one for a specific time and place. Taxis Combined is Sydney’s largest taxi company and you can book online at http://www.taxiscombined.com.au or call them on 133 300. Other contacts include RSL on 13 22 11 and Legion 13 12 71.